It’s everywhere and virtually impossible to ignore. Retail sites, blogs and social media are bombarding us with gift ideas, special sales and virtual snow flakes. 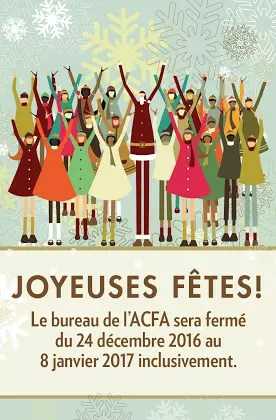 Whether you call it “Christmas” or “Holidays”, the end of the year brings a special cheer that you can’t miss. No need to say that the season also becomes a marketing opportunity for many businesses. It doesn’t matter where you stand, you can’t stop the trend and you don’t want to miss the boat! The Holiday Season could also help your reinforce your corporate identity by making your customers feel special. It’s actually the perfect occasion for a personal touch, since this time of the year is filled with a unique atmosphere and focused on family time. In other words: relationships and links (spiritual or otherwise) between people. So what’s your strategy for the Holidays? 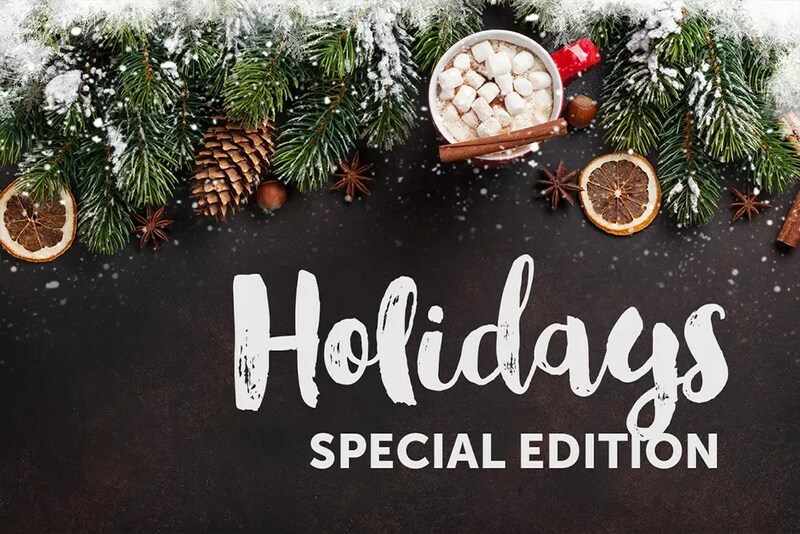 How is that special Christmas touch for your brand going to serve your relationship with your customers? What can you do to remind them that you’re here during the busiest time of the year? Of course, you’ll find free online tools and websites that can give you a generic image for the Holidays. By now, though, you should know the results won’t be up to par (Top 4 reasons to choose a professional and local business for your brand). Like anything related to your brand, you want professional graphic artists to do the job. Who knows you better and can serve you better than the experts who helped you develop your brand? Let them take care of you and your customers during the Holidays. Your brand will remain unique, but with a little Christmas cheer. The idea is just to infuse a special sparkle in your brand that’s going to touch your customers. The process will re-establish that good feeling of trust and personalized customer service. Let’s take an example. Here’s a full campaign, printed and online, for a non-profit organization that can be applied to any branding strategy. All in all, it’s just a great example of good business practice. You might even find cool ideas for your own business venture here. On top of adding a personal touch to your brand, it also has several other benefits. For instance, if you send your Christmas cards well in advance, you’ll maximize their impact. Most people like to decorate their home with the cards they receive. Same thing with businesses. There will be a dedicated corner with cards. The cards will stay there for a period of time, during the whole Season and even into the New Year. Oh joyful result: your customers and the customers of your customers will be exposed to your brand, which will get engraved in their mind. A beautiful print design might first appear old fashioned, but will definitely work for you, especially during the Holidays. People tend to come back to traditions during that time. They’ll love a pretty printed Christmas card. Let’s go back to our example. 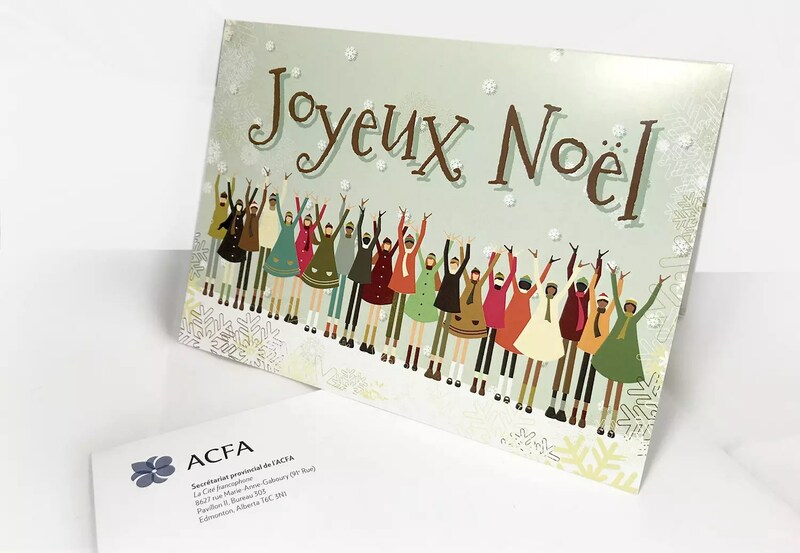 To complete the Christmas card, the team at Creative Coco’Nuts developed a tool for electronic communication, which is a must in today’s market. 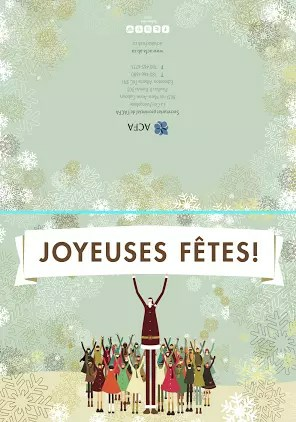 This particular email signature has the same visual design as the card and conveys the same message: a gathering of people coming from different horizons to wish you a good Holiday Season, all looking towards the same direction and doing the same thing (another way to say “working towards a common goal”). The diversity in sizes and colours of the snow flakes in the background conveys the same idea. The email signature is a very efficient communication tool. In this instance, it tells the recipients when the office will be closed during the Holidays. It allows you to be proactive. Your clients won’t be frustrated because they call your office and nobody answers the phone or because your door is closed. You told them, you gave them some Christmas cheer and you put your brand out there. Social media are also a must to reaffirm your web presence. An exceptional visual design on Instagram will speak directly to your followers. You might have already sent a Christmas card to most of them and/or answered one of their emails, so by now they’re used to your seasonal brand. In our example, Creative Coco’Nuts also developed banners for Facebook and Twitter. The banners are personal, they’re customized and don’t talk about Christmas in general. The visual branding is unique to the customer and speaks to their customers. Mission accomplished. It’s everywhere and virtually impossible to ignore. Holiday branding is always a win-win situation. You said “We’re thinking about you”. Your customers feel valued. They’ll do business with you again and again. For more information on this service, please see Branding & Illustrations and Print & Advertising.